Former two division champion Timothy Bradley was very impressed by Saturday's performance by IBF welterweight king Errol Spence (25-0, 21 KOs). 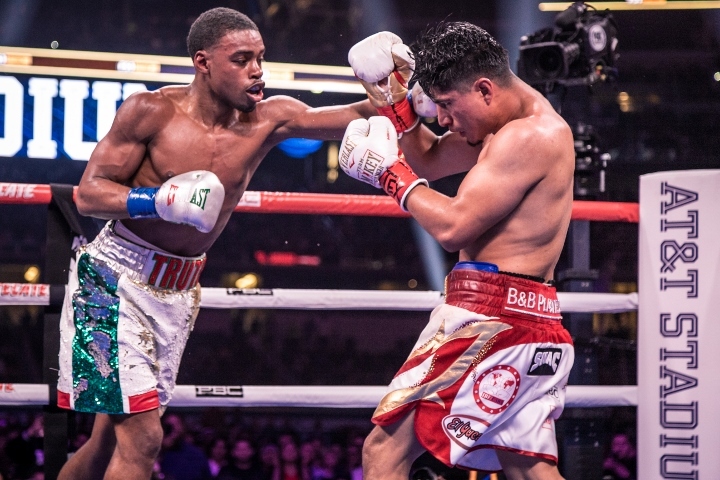 Spence dominated four division world champion Mikey Garcia over twelve rounds of action to win a lopsided unanimous decision at AT&T Stadium in Arlington, Texas. Bradley admits that he gave Garcia "too much credit" prior to the fight. He thought the action would be a little more competitive. Garcia, who holds the WBC lightweight title, took a big risk by moving up in weight by twelve pounds and two full weight classes. He felt Garcia could be done after this, based on the punishment that he took and the huge paycheck that he earned for the fight. "I like the fact that [Spence] went twelve rounds. I saw him get a little gassed because he threw a ton of punches man. He threw a ton of punches, over a 1,000 punches - that's unreal. I didn't think that he had that in him, to throw that many punches. He was in one gear I saw. Maybe he was in one gear because he overtrained. I didn't see that real snap on his punches, they were more like placement punches," Bradley said to AB Boxing News. "But what I did see.. is like controlling distance - phenomenal. He moved his head, got out of the way in spots. He made Garcia just look foolish. It was horrible. I think honestly right now there's a possibility that Garcia can be done. Honesty he could be done. Think about it, his brother [Robert Garcia] retired at 29. "Mikey has done a lot in the sport. He hasn't had a real big, big significant win, but he's captured four world championships which is great. And at the same time he got a huge paycheck. When you get big paychecks..... when was the last time you saw Conor McGregor get back in there? It took him a minute to get back in there to fight for a couple mill bro." Bradley was shocked at how little Garcia was able to do against Spence - including the fact that he couldn't even get close to the unbeaten champion to connect with anything. "Mikey couldn't even land a punch on him. Mikey is a world class fighter, top 10. He should have been able to land something significant on Spence. But he couldn't. And if he did it was one punch at a time, there was no follow-up. He couldn't even get close to him to throw bro. And this is Mikey Garcia we're talking about. Speed wasn't there, Spence wasn't affected by his punching power," Bradley said. [QUOTE=Tha Kid;19653172]You're GAY :boxing:[/QUOTE] lmao... sorry you got owned son.